Franz Albert Nürnberger Junior (April 24, 1854 – February 15, 1931) represented the fifth generation of the Nürnberger bow making family from the town of Markneukirchen in Germany. 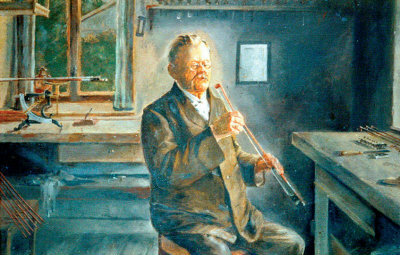 The family tradition began in the mid-18th century with Franz Albert Junior’s great-great grandfather, Johann Adam Nürnberger, who made both violins and bows. Since then it has extended over eight generations to the great grandchild of Franz Albert Junior, Christian Albert Nürnberger, who is still making bows today. With nearly 300 years of continuous bow making between them, the Nürnbergers are probably the oldest and longest-running bow making family in the world. Franz-Albert Junior’s grandfather was Christian Gottlob Nürnberger, who was connected with the Knopf family and worked with Christian Wilhelm Knopf before he started his own workshop in 1824. 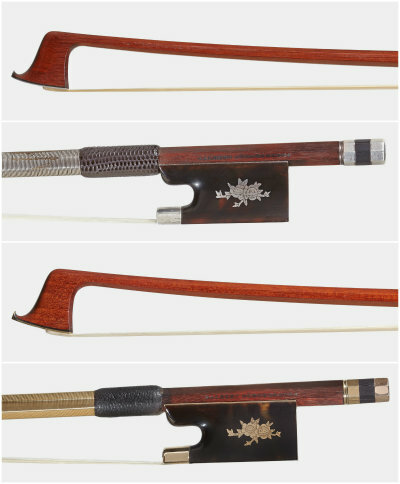 Christian Gottlob’s son, Franz Albert Senior, made fine bows for Weichold, Hammig and Heinrich Knopf. He was the primary initiator of and, together with Franz Albert Junior, founder of Germany’s first bow makers’ guild in 1888. Until then bow making had been an unrecognized craft and the new guild gave the country’s bow makers important rights and protection for the first time. Franz Albert Junior began to learn bow making from his father, Franz Albert Senior, around 1868 and by 1900 had developed into a skilful bow maker. He was described by Rudolph Wurlitzer as ‘the greatest modern bow maker’ in his firm’s 1906 catalog. To receive this accolade at the same time as Eugène Sartory was working in Paris was an extraordinary compliment. Wurlitzer was one of the leading violin and bow experts at that time, and possessed an important collection of fine bows by Tourte, Peccatte and Kittel among others. Some bows by Franz Albert Junior have frogs of tortoiseshell mounted in silver or gold, with a silver or gold bouquet of flowers engraved on each side (examples shown right), similar to those made by Joseph Henry and François Nicolas Voirin about 50 years earlier. These bows represent some of Franz Albert Junior’s finest work and show him at the peak of his craft. Due to their well-chosen wood, excellent balance and fine workmanship, the bows of Franz Albert Junior have been played by soloists including Eugène Ysaÿe, Jan Kubelík, Fritz Kreisler and David Oistrakh. Daniel Brücker is an expert and consultant in fine instruments and bows at Henley’s in Cologne, and is author of ‘Der Goldbogen’, a reference book of soloists’ bows.